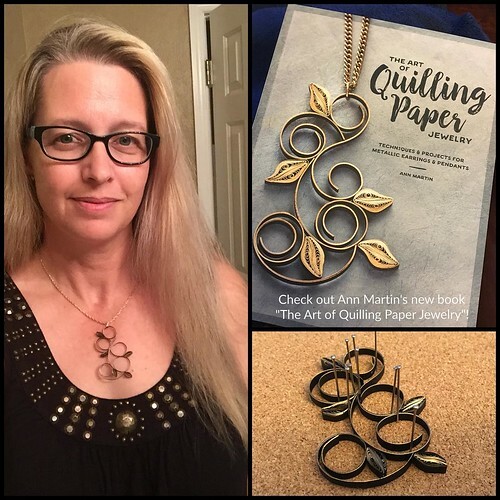 Now that The Art of Quilling Paper Jewelry has been released, I've been enjoying seeing necklaces and earrings that are being made from the book's projects and am sharing them in this post. Also, there have been a couple of questions that I've replied to on Facebook. Because you may be wondering the same things, I'll include my answers here as well. Question: I'm new to jewelry making and don't have special findings or jewelry pliers... can I still make the projects? Yes! Here's a brilliant example by Erin Curet of Little Circles Quilling. 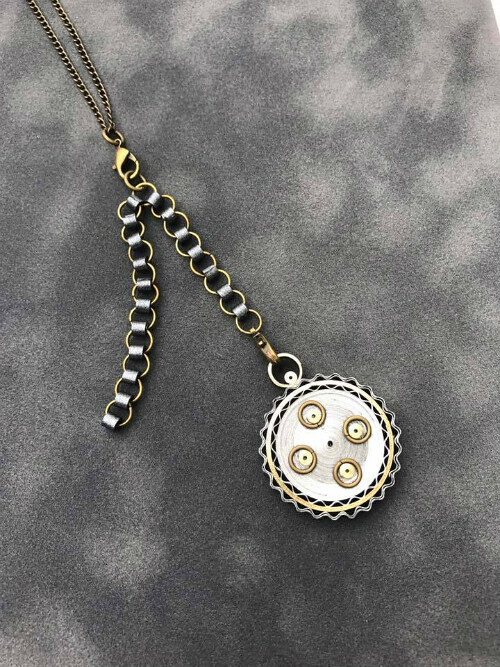 You can definitely make the pendants without specialized supplies. In fact, the books shows how to make jump rings from paper instead of purchasing metal jump rings. Substitute hemp twine, as Erin did, or silk cord rather than metallic necklace chains. 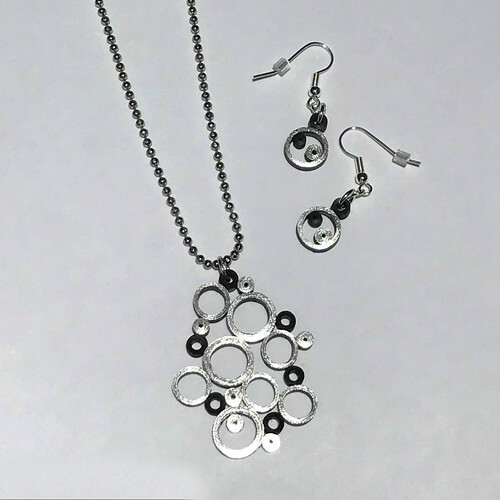 For the earring projects, you will need small findings... earring wires and jump rings, along with a pair of jewelry pliers to attach them. 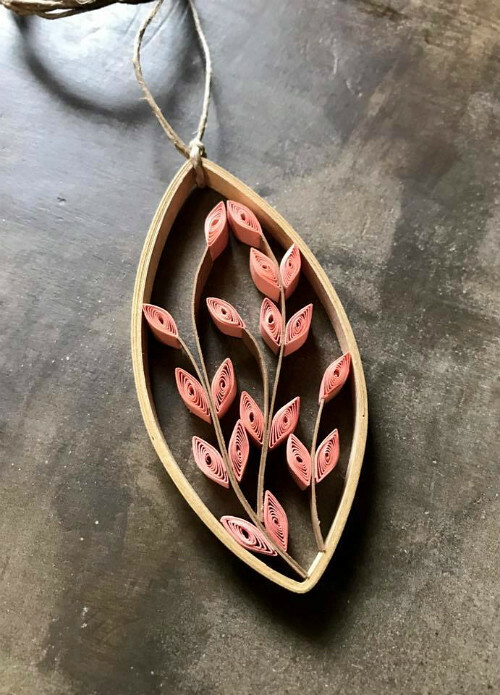 Erin made the Leafy Vine Pendant design using her own brand of quilling paper, proof that you don't even need metallic edge quilling paper to make a pretty piece. And while you can use ordinary items to serve as dowels for shaping jewelry components - pens, glue tubes, etc. - Little Circles has sets of bamboo dowels and circle forms that are ideal for that purpose. For example, Erin used a circle form to make the marquise frame of her pendant. Personally, when I started making jewelry, I didn't have the right supplies and felt intimidated by the aisles at my local craft store. Sooooo many options! But I soon learned that all I really needed was a small pair of jewelry pliers, a package of jump rings, and earring wires/necklace chains. None of these items are expensive... quite the opposite, actually. Question: Is the book written for beginners? Yes, the book teaches beginners how to quill. The projects range from simple, yet stylish to more time-consuming designs that will give experienced quillers fresh inspiration. 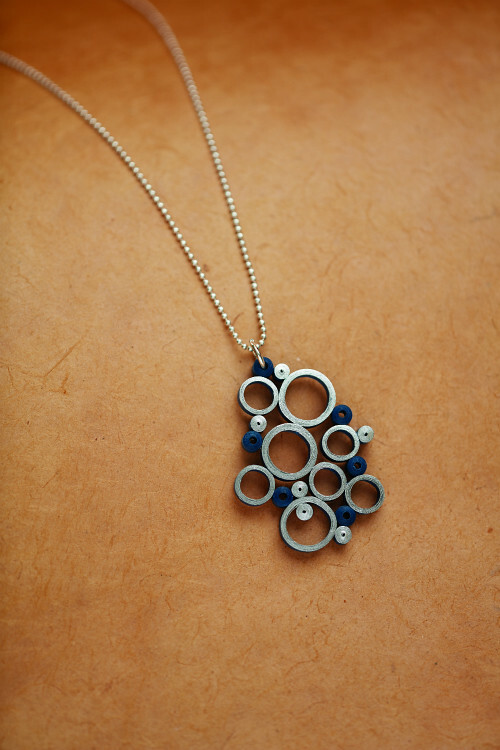 You might recall the Blue Bubbles Pendant (above) that I shared in last week's book giveaway post. It's an example of a design that is a good starter project. And here it is, as made by Deb Mackes, who used silver-edge black strips. She went one step further than the book and made a great pair of matching earrings too, all of which she gave to her sister as a special birthday gift. I've known Deb and her lovely work for a long time... she is a master of quilled snowflakes (see free patterns she shared here and here) and recently opened an Etsy shop, plus she has a Facebook page, Deb Mackes Quilling, where she has been posting projects of her own design created since being inspired by the book to continue making jewelry. 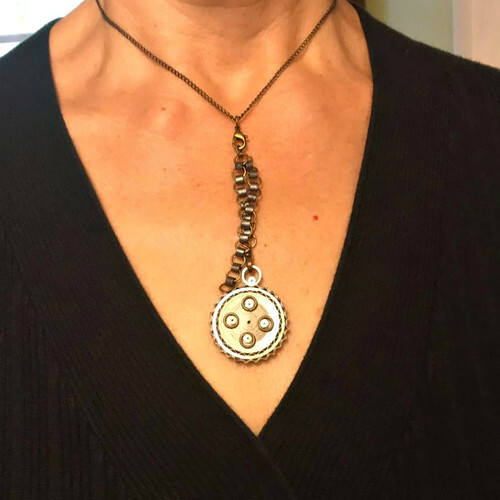 How cool is this steampunk necklace, for example? Look how pretty it is... all shiny and gear and sprocket-reminiscent! Gilded edge papers truly give a metallic look. By the way, Deb has started a Facebook group, Florida Quillers, with the hope of reaching Floridians who would like to meet for classes or get-togethers. They are having their first mini-meet in October. 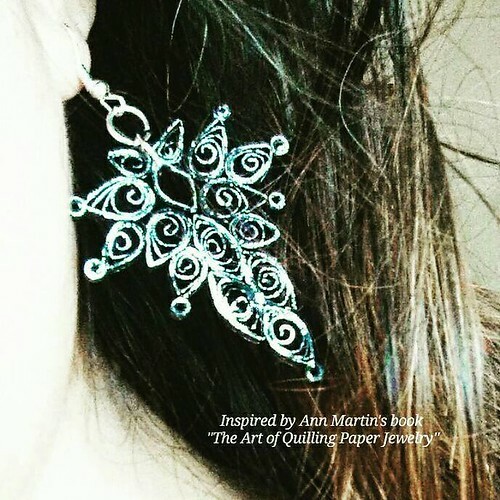 Pily Núñez of Crea Quilling on Facebook and Instagram did a lovely job making the book's Art Deco Earrings. Because Pily didn't have metallic-edge paper, she devised her own shiny edging that looks really nice! She plans to detail her process in an upcoming post via her blog, Quilling Chile, so be on the lookout for that. Last, but definitely not least of the shared projects I've come across to date, Jennifer Stacy recreated the Loops and Leaves Pendant cover design beautifully and wrote about the experience on her blog, Quilling Fun. Jennifer is a very active quiller who has an Etsy shop also called Quilling Fun. Find her on Facebook and Instagram too. Last thing... do you know about the many All Free sites? Each one shares thousands of links to tutorials. For example, here are my project tutorials as listed on AllFreeJewelryMaking, AllFreeChristmasCrafts, AllFreePaperCrafts, and FaveCrafts. For those of you who love giveaways, each site always has two underway that are paired with reviews of craft supplies and books... they're a great way to stay in touch with new products. Very beautiful the different interpretations. Congratulations to all! Thanks Ann for the honor of including me in this article. Your wonderful book is a great source of inspiration for me. I'm so glad you enjoyed the post, Pily, and how nice you find the book inspiring! Honey, I'm glad you liked seeing the projects... I always enjoy yours as well!